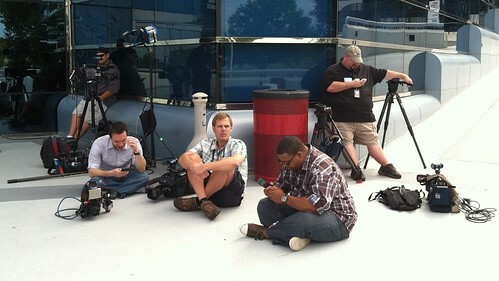 Isn’t it strange that we TV news photojournalists are widely renowned for our lousy attitudes? Why are we pissed? We have an all-access pass to life, dress like we're always on vacation, and basically sight-see for a living...Okay, there's more to it than that, but on the whole my profession calls for just as much daring as it does drudgery. Yet the classic stereotype of a news shooter is that of an anti-social, slightly subversive loner dripping in spite, self-loathing and cynicism. Of course we’re not all like that, but walks the halls of any TV station and I guarantee you’ll find at least one lost soul who fits that bill. In fact, I think it's part of the Equal Opportunity Employment Act. Here it goes right here.. Article 19 Section 4 Paragraph 5...All broadcast facilities within the contiguous U.S. will seek out and continue to employ one badly-aging ENG camera operator whose sole purpose is to impress upon all others what a righteous sewer this place is, emphasizing to all how it could all be fixed if just every fellow employee would make a single file line at the nearest exit and GET THE HELL OUT OF HIS LIFE! 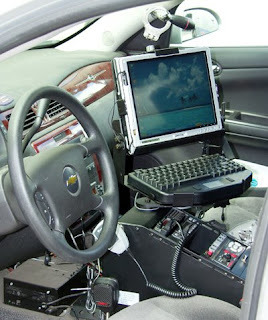 Okay, so I was a bit on edge that day, but you would be too if you spent three hours hunched over an dying eyepiece in a cramped shotgun seat of a tricked-out police car, all so you can obtain the same seven shots you did on your very first ride-along fifteen years ago. It’s enough to make the most affable of chaps go a little postal. In fact, I sometimes get so fired up over the predicable anguish of The Job that I could french-kiss a chainsaw and come out the winner. What exactly that means I don't know, but I do sometimes wonder would If I'd get this pissed off if I were peddling carpet samples, or installing stereos, or assembling snowmobiles. Something tells me I would, but it won't stop me from swearing up and down I'm wasting my life away sometime next week. A thousand ribbon-cuttings will do that to a fellow. For me though, nothing assures me I'm following the right path in life than a visit to good ole Corporate America. Ten minutes inside the hushed confines of a super-polite cubicle-farm and I break out in a cold sweat. I grow pale, get dizzy and want to rip down every Dilbert cartoon in sight before running down the hall to tip over the snack machine. For reasons I don’t fully comprehend, I yearn to smell the pine tree air freshener hanging from my news unit's rearview mirror, to race it's engines to the nearest crime tape and soak up the ambience of live truck fumes, tripod clusters and chain-smoking strangers. For it's only in this sordid, deadline-filled pressure-cooker world of daily TV news that I feel truly at home. Sure, I may mumble about the colossal stupidity of today's assignment, but pay it no mind. All that gruff and cynicism is simply a front - a defense mechanism to hide the fact that I'm still pretty stoked to be in such an unpredictable, improbable, inane profession. I somehow doubt furniture upholsters feel the same way about their jobs. Then again, no one disturbs their sleep because an abandoned warehouse catches fire. You are a good writer please for God's sake don't become a TV reporter. The rage will fade to laughter one day. You won't see it coming you will be standing on main street laughing at your own private joke. Here comes the feature reporter on the back of a circus elephant parade suddenly his elephant stops and deposits about 5 gallons of urine slowly in front of you and REC is still glowing red in your viewfinder as he finishes. That will be a moment of clarity. You just said it all. Wrapped it up in a nutshell. All I know is that I thought that being a high school history teacher was going to be my lot in life. But I couldn't stay indoors cooped-up. I don't care if it's -30 wind chill, I'd rather be outside with no roof and the cold. Wait, geez, I forgot to take my lithium again.. Sometimes I think some pay disparities can be explained by the relative awfulness of the work. Musicians make lousy money but they have a lot of fun. CFOs make tons of money but do they have a ton of fun? As an intermittently employed non-mainstream person I can enjoy Dilbert cartoons in an anthropological way. I wouldn't mind having a job like yours for a little while at least. Sometimes you get to go to exciting places.